The courier offers a wide range of same-day delivery services within the Atlanta market, from time-sensitive packages to volume part orders. AQuickDelivery, a recognized leader for same-day delivery, messenger and transportation services announces same day multi-box deliveries. AQuickDelivery is the best choice for same-day courier and transportation solution throughout the Atlanta and Metro-Atlanta area. The courier service offers a wide range of same-day delivery services within the Atlanta market, from time-sensitive packages to volume part orders. The announcement markets its multi-box delivery services to expand its customer base, increase sales growth and advertise its same-day courier products. From one box to several boxes, AQuickDelivery utilizes various vehicles sizes to accommodate its customers deliveries on-demand. Box trucks are also available for transporting 40 or more boxes, whether loose or palletized. Contingent upon box pick up loading time, box count and transit distance, AQuickDelivery provides its fastest, premium Direct delivery service within approximately an hour. The service involves the pick up occurring within a 30-minute window, beginning from the time the customer states the boxes are ready. Once the AQuickDelivery driver has the boxes on board, it is transported directly to the destination for delivery. Prices are based primarily from zip code to zip code. AQuickDelivery also has the logistical expertise to implement scheduled same day multi-box delivery solutions. Corporation distribution centers and warehouses have various boxed products or parts necessary operationally daily. Box deliveries can be made between multiple locations locally, or even state to state. These types of same-day deliveries results in business vehicles and employees being more efficient and increases time maximization. 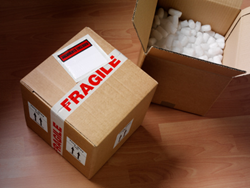 Requests for same-day multi-box deliveries can be made via phone or online. For any specific box pick up, loading or delivery instructions, customers are recommended to contact AQuickDelivery to discuss their box delivery needs. AQuickDelivery is a premier same-day courier offering transportation and distribution services. From packages to palletized freight, AQuickDelivery delivers fast. As a leader in the courier industry, its goal is to perform optimal courier logistic solutions and superior customer service every time. The Atlanta courier provides same-day delivery successfully for over 1,500 clients, including Fortune 500 companies throughout the Georgia area.